He is an American boxer and the former WBC Middleweight Champion as well as Olympic gold medalist. He fought the Japanese KO king Takamura Mamoru for the Middleweight title. Eagle was an undefeated Olympic gold medalist prior to the start of his successful pro career. Barreling through a mere fifteen fights before reaching world champion level, Eagle is said to have never tasted defeat due to his dedication and tactical skillset. As opposed to fellow American (former) boxer Bryan Hawk, Eagle comes off as polite and easy-going, willing to overlook his schedule to answer a question from the Japanese press. He is disciplined and serious despite being undefeated, remaining modest and unpretentious of his boxing abilities. Against strong opponents Eagle shows a fiercely competitive, spirited, and strategically observant side, claiming he has never been able to show his true potential in any fight until his match against Takamura. 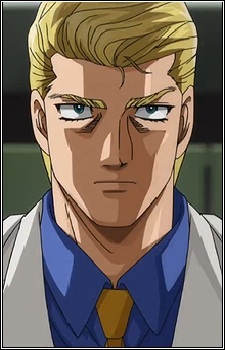 David Eagle is easily one of the strongest characters in the series, evident from the fact that he brought Takamura Mamoru to the verge of defeat, being the second person to do so after his compatriot Bryan Hawk. David is an all around by the book boxer, using basic boxing techniques and strategies which are polished to the highest level. His most deadly "weapon" is a sharp, solid One-Two that Coach Kamogawa has even stated to be near perfection. Despite his hard work and determination, Eagle loses to Takamura after their lengthy match, remarking that Takamura's strength is phenomenal having experienced it himself. Regardless of his loss Eagle is viewed as an excellent sportsman and leaves with the favor of the Japanese. He was last seen in Las Vegas, watching the match between Alexander Volg Zangief and Mike Elliot.